Marxist-Leninist revolution is a subtle and often slow process. While most people focus on the often spectacular and bloody finale, they fail to see the years, or even decades, of disciplined subversion that has gone before. Real communists understand they are part of history. They see their mission as long term, stretching well beyond their own life time. They understand that to move humanity “forward,” it will often be necessary to work with and manipulate unfriendly or even opposing social forces to achieve some incremental change towards their ultimate goal. Here, senior Ohio Communist Party USA leader Rick Nagin explains that Nelson Mandela never abandoned communism, but was a disciplined revolutionary who used business and other social forces to move South Africa towards socialism. He makes the point that US communists need to be equally subtle and disciplined – to work even with segments of business and of course their “friend” Barack Obama and the Democrats to bring about a socialist America. This is the point that fools most modern observers. They see countries like South Africa, Brazil, China or Vietnam – ruled by communists, but open to working with and even encouraging capitalism. They see this as evidence that the leaders are communists in name only. They think that capitalists are using the communists. In fact, the opposite is occurring – as time will eventually tell. The communist movement has abandoned the adventurism and impatience of its early days. Now the modus operandi is to build up wealth, or cooperate with capitalism when it suits them. Only when the West is taken down and the United States is disarmed or destroyed, will gullible capitalists all over the world feel the Leninist lash. Only then will the old style communism reemerge. When opposition is futile. That day is much closer than most Westerners think. The article also points out that after the overthrow of apartheid, when the ANC held a parliamentary majority, it was the SACP that “was the most ardent advocate of sharing power with the white regime” and resisted those who demanded immediate nationalization of the mines and other industries and other measures of retribution contained in the South African Freedom Charter. Quoting British historian Stephen Ellis, the article states,” Today, the ANC officially claims still to be at the first stage … of a two-stage revolution. 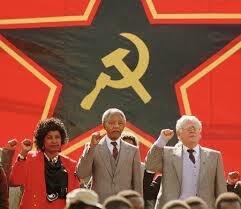 This is a theory obtained directly from Soviet thinking.” The official line in the our mass media is that while the U.S. sided with the apartheid regime for Cold War reasons, Mandela is now acceptable and can be honored because he allegedly changed while in prison and moved away from revolutionary forces in the ANC. The truth is the exact opposite. When the apartheid regime offered to release him if he would renounce violence and break ties with the SACP, Mandela, recognizing that this would shatter the ANC, displayed extraordinary moral courage and refused. 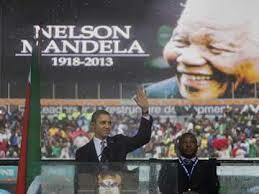 As Mandela himself insisted, he never stopped being a revolutionary. It’s just that revolutionary theory is far more subtle and sophisticated than the media is willing to recognize. When it comes to communism, the media prefers crude stereotypes. All revolutions go through stages, including the revolution that established capitalism in our country. The first anti-colonial stage was led by George Washington, but the completion, the second stage, required elimination of slavery, and was led by Abraham Lincoln. Many of the northern leaders of the first stage, including Franklin, Paine and John Adams, opposed slavery, but the necessary political coalition – broadly based and black and white – to abolish slavery would not materialize for another 70 years. Today we in the U.S. face the challenge of defeating right-wing extremism. There are some who would like to skip this stage and put attacking President Obama and the Democrats on an equal footing. This tactic is both divisive and counter-productive. If labor and its allies do not yet have the strength to defeat the extremist section of corporate power how can they hope to defeat corporate power altogether? The extremists are growing more isolated and the progressive forces are gaining strength but the support of the Democratic parts of the ruling class is still very much needed. 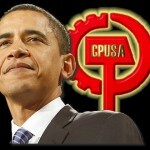 The newly formed Wall Street-based “Third Way” group could be an effort to split the Obama coalition. To prevent this and win at this stage we need to emulate the steadfastness and political maturity shown by Mandela and the South African Communist Party. If you want to really understand the unfolding American revolution, please read and re-read comrade Nagin’s essay. He gets it just right.